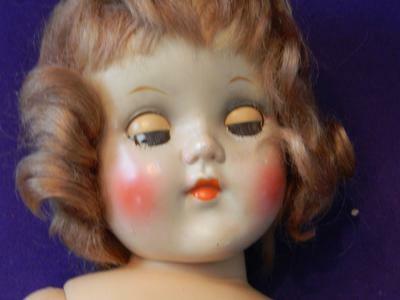 I have a 16 inch doll, hard plastic, sleepy-blue-eyed doll from the 1940's and absolutely no markings. She was mine as a child, when such things were of no matter. My collection was recently returned, after having been lost and thought gone forever, and as a grown-up, I'd like to know more about all the girls. Toni and Mary Hoyer are well-marked, Terri Lee is unmistakable, and 18" Carolyn's dress survived, tag from Eugenia Doll Company intact, so she's known, as is the 12" Shirley Temple with plugged hair. "Red" has a mohair wig, bright rouge on her cheeks, knees and the backs of her hands. Her fingernails are bright red (possibly applied by me or my cousin, with whom she lived after me, as I found nail polish on one of the dresses). Her hands and feet are well-detailed, toenails unpainted. Because her clothing was missing, or at least not identified, that gives no clue, either. She has something of a Mary Hoyer look about her, but her 16" size suggests she isn't from Mary Hoyer. Anybody know who she might be? Any help very much appreciated. She's a smidge bigger, face is plumper and rosier cheeked than Toni. I have a Toni, too. Side by side, definitely not. But thank you for the suggestion, Margaret.